The choices in the types of savings instruments available to the public have risen manifold in recent years. 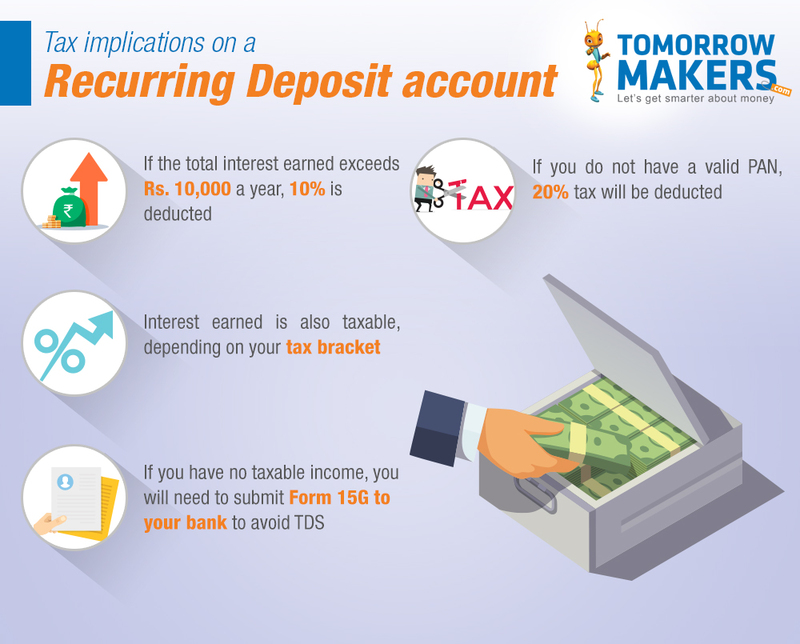 However, one investment option that has stayed popular amongst people of all age groups is Recurring Deposit (RD). The main reason for this is that RDs are one of the safest investment instruments available. The following questions will resolve some of the most common queries regarding RDs. This is a version of a ‘term deposit’ offered by Indian banks. It allows the investors to credit a fixed amount into their Recurring Deposit account on a monthly basis, and earn interest at a rate that varies between 5.25% to 7.90% for a tenure of one year. The primary benefit of a recurring deposit over an FD is that you can commit to investing a fixed amount every month, whereas an FD relies on a lump sum payment, which many may not be in a position to do regularly. How does an RD work? Unlike Fixed Deposit, you can deposit a fixed sum with your Bank or Post Office for a pre-defined term every month. In return, you receive interest at a pre-defined rate, and at the end of the term, the invested capital along with accumulated interest is paid to you. It is important to remember that, once you start an RD account, the deposit amount and term cannot be altered. Additionally, there are no weekly or quarterly deposit payment options. What is the amount I can deposit every month? Most banks have a minimum deposit amount of Rs. 500, though it can even be as low as Rs. 100. You must also commit to making deposits in multiples of Rs. 500, though some banks may allow deposits in multiples of Rs. 100. It is best to check with your bank what their specific policies are in this regard. How long is the term of an RD? The minimum period for almost all RDs is 6 months, and this is extendable by multiples of 3 months up to a maximum permissible period of 10 years (120 months). The benefit that RDs offer is that you can define the length of the term. However, once fixed, that period will also serve as a ‘lock-in’ (usually 3 months) for your investment. What is the interest rate paid on RDs? The interest rate offered on RDs is directly correlated to the prime rate of the Reserve Bank of India (RBI) and is compounded and credited to the account on a quarterly basis. Rates currently range from 7.5% to 9.00%. Senior citizens are eligible for an additional interest rate of 0.25% to 0.75% over and above standard interest rate offered by most banks. You must check this rate with your bank before opening an RD account. Can I redeem my RD before the end of its term? You can stop your deposits at any time and even redeem your investment when you want to. However, you could incur a small penalty (usually 1% of the interest earned) for cancelling your RD prematurely. This penalty will be defined at the time of opening the RD. However, the principal money invested is not affected under any circumstances. Do RDs have a nominee/beneficiary facility? Yes, all such deposits have a nominee or beneficiary assigned to the account. You can also change the nominee at any time by filling in the appropriate paperwork with your bank. Can an RD be opened for a minor, or as a joint account? Yes. You can open an RD account for a minor (child below 18 years) and even with someone else, as a joint account. Does a Recurring Deposit account offer benefits to senior citizens? The primary benefit to senior citizens is an additional interest rate which varies from 0.25% to 0.75%. This rate is paid to those who have reached or crossed 60 years of age. Related: Are you making the most of your savings account? What happens if I delay the monthly deposit payment? When you open an RD account, you are informed about the maturity value under the assumption that the monthly instalments will be deposited on the due date. A delay of even one day will mean that the interest penalty will apply for the whole month, or there could be a cash penalty that is a proportion of the monthly deposit. Either way, it affects your payout on maturity to some extent. If you default on your monthly instalments frequently and have six outstanding instalments, some banks reserve the right to close the RD account. The interest rate payable will be as per the premature redemption aspect of the RD agreement. Can I make partial withdrawals from my RD Account? No, partial withdrawals are not allowed. Additionally, you cannot ask for periodic payouts of just the interest component. The interest will be paid when the account is either closed prematurely (subject to the early redemption penalty) or on maturity. What other benefits can you avail of with an RD? Most banks provide loans of up to 90% of the current deposit value. The interest charged on such loans is also lower than that of a personal loan – usually no more than 1% of the deposit rate the bank is paying on the RD. This facility comes into its own if the investor requires cash for an emergency, especially since the RD continues to earn interest, and one does not have to pay the penalty for the premature withdrawal of the deposit. Investors are eligible for tax exemption on Recurring Deposits only if they invest in an RD through India post, and in a 5-year scheme (at least). The maximum taxable deduction, under Section 80C of the Income Tax Act of 1961, is Rs. 1 lakh. Who should invest in RD? A Recurring Deposit is a good investment option for risk-averse investors as the product offers fixed returns with no risk. It is particularly suited for those who do not have a lump-sum to invest and would rather put money away on a regular basis. Recurring deposits are ideal for people who are looking to meet their short-term goals. Are you interested to Read More?